Toyota Motor Philippines is ramping up the excitement this summer as the biggest one-make race (69 racers) in the country gears up once more. The Toyota Vios Cup Season 4 races to the Clark International Speedway for Round 1 this Friday, April 28 to Saturday, April 29. Revised rules and a slew of new celebrity racers will make it a heart-pounding event that both petrol heads and families can enjoy. “For Toyota, nothing communicates Waku-Doki, or the fun in driving more than the exciting world of motorsports—this was realized in the first three seasons that started in 2014. Piloted by none other than the best-selling vehicle in the country, the Vios has proven that aside from its features of quality, durability and reliability… it is also a car designed for fun,” said Mr. Satoru Suzuki, President of Toyota Motor Philippines. This season, organizers are introducing new sporting rules and regulations that are bound to make the race even more tightly contested. For starters, Season 4 is introducing the concept of Team Awards. By having one driver compete in reach of the three classes, they can earn points for their respective teams. The team with the most number of points during a race weekend will get a trophy. The team that garners the most points cumulatively will also have an Overall Team Champion trophy. Next, the qualifying (QTT) results will only determine the grid position of Race 1 only. To add excitement, Race 2 will apply a reverse grid for the Top 6 cars only for each class. Driver qualifications have also changed for Season 4 with the Promotional Class allowing Novice and Club C racing licenses; Club C and National C for the Sporting Class; and Club B, National C, and National B licenses for the Super Sporting Class. Sponsored drivers line up in the Sporting and Super Sporting Class while celebrities will line-up in the Promotional Class. The Vios One-Make Race (OMR) will also see some changes for Season 4. For starters, only one engine may be used throughout the season. Any engine change will result in a 10-place grid penalty. Any modification or wrong parts installed on the race car will be subject to immediate disqualification. Next, they will be moving to the new Bridgestone RE003 tire for all classes while also being equipped with Rota alloy wheels exclusively developed for the race. Pedal pads will now be allowed as will a choice between Brembo or Toyota original brake pads. For the highest tier Super Sporting Class, they’ll get the option of running a slightly-modified Vios OMR fitted with a TRD exhaust manifold and suspension bushings. They’ll also see a reduced minimum weight of 1,050 kilograms (including driver) while the lower classes retain the 1,100-kilogram minimum weight. For Toyota Vios Cup Season 4, 8 celebrities will join the grid including 5 new faces. Continuing their successful run last season, Jericho Rosales, Jasmine Curtis-Smith, and Fabio Ide will line-up with newbies Aubrey Miles, Gretchen Ho, Ella Cruz, Dominic Roque, and Jake Cuenca. 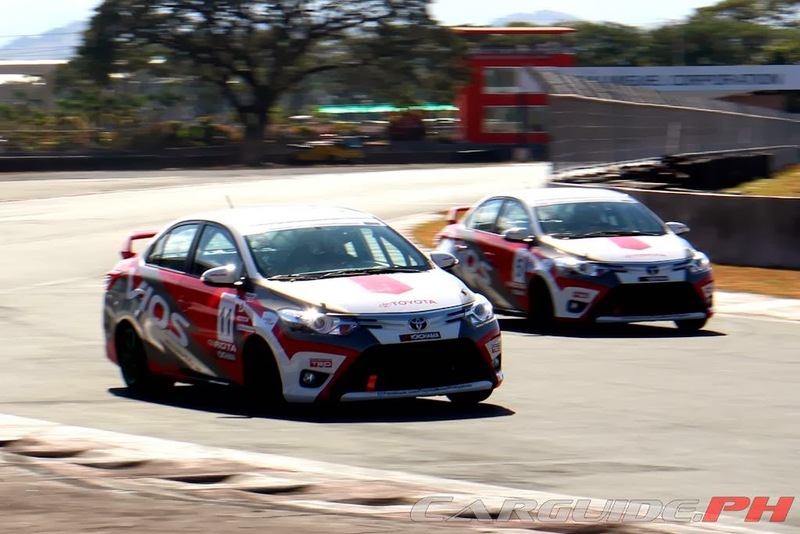 The changes to the Toyota Vios Cup’s rules and regulations are timely as Toyota Motor Philippines is aligning it to Toyota’s global racing efforts under the Toyota Gazoo Racing (TGR) brand. As Toyota’s special motorsports division, Toyota Gazoo Racing develops technologies and solutions for Toyota’s motorsports activities, including the local Toyota Vios Cup. The Vios Cup is now recognized as part of TGR’s Asian racing events. The Toyota Vios Cup Season 4 kicks off with Round 1 this April 28-29 at the Clark International Speedway followed by Round 2 in June 10-11 again at Clark International Speedway. Round 3 is slated for September 15-16 with the venue to be announced while Round 4 wraps up the year on November 10-11 at the Clark International Speedway. “I would like to thank our partners who share the same vision and passion that we at Toyota have. To our newest sponsor, TOTAL and of course, the continued support of Bridgestone and ROTA, all of which are our major sponsors. To Motul, Brembo, AVT, Denso, OMP and Tuason Racing, thank you for being united with Toyota all in the name of good and fun racing,” concluded Mr. Suzuki.